Bright white and gold is nice brassy gold. I would suggest wiping down the legs before assembly as they were very dirty/greasy and some of that transferred onto the seats during assembly- it did wipe off very easily though. Don’t expect these to be super high quality- some buckling of material in the middle of the seat- nothing that can’t be flattened out with a stroke of your hand. I think for the price they are good value. Also they have some protection at the bottom to protect flooring. I’m happy with these. 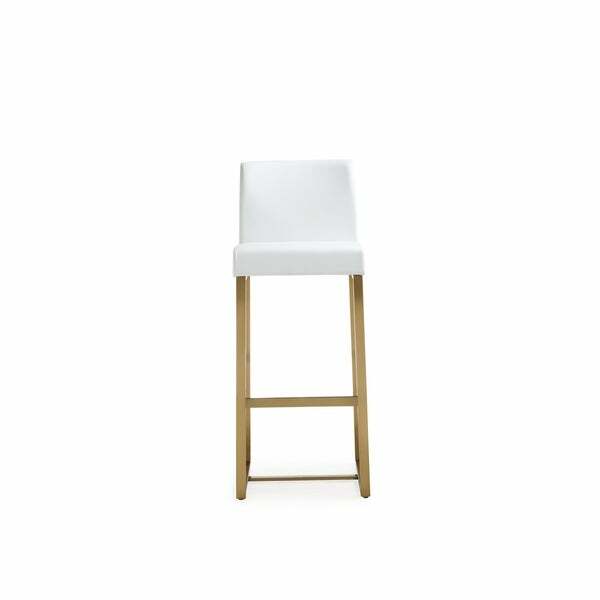 Furnish your kitchen or bar area in contemporary style with the Ferrara barstool. The gold solid stainless steel frame provides a sturdy base, while the plush seat and footrest ensure maximum comfort. The combination of angles and gentle curves gives this stool an eye-catching appearance, while the neutral color allows it to match well with any decor. Dimensions 18.5 In. X 15.75 In. X 41.3 In. "Can you please provide the exact seat height (rather than "approximate")? On another site, for what seems to be the exact same product, they note that the seat height is 25.9' I am hoping this is the same. Please can you confirm?" "What is the height of the actual stool/seat?"